BIG BLUE WAVE: On ProLife "Monomania"
The pro-life movement is infested with cranks who suffer from monomania. Most of us know someone of this type. When you mention that children are dying from bombings in the Middle East, they say “You know what else kills children? Abortion.” When you mention neglect in nursing homes, they say “You know who else is neglected? Unborn babies.” When you tell them that pigs suffer in gestation cages, you’re reminded about fetal suffering. When you talk about AIDS, they tell you that Doctors Without Borders is pro-choice. When you can’t take it anymore and pour yourself a soothing rum and Coke, they tell you there are human fetal cells in Pepsi. They have only one setting, and that’s not their only problem. These monomaniacs are uniquely gullible. They are convinced that, however many lies a politician tells, the politician can be trusted if he says something against abortion. Never mind if he was saying something for abortion a year or a day or five minutes ago; if he says something even vaguely anti-abortion now, he’s their candidate. And never mind if the candidate supports the killing of any other sort of human being, far and away beyond the parameters of Just War or the principle of double effect. If he’s said anything even cursorily against abortion lately, they make excuses for him for everything else. They say that Just War is confusing so it doesn’t count. They say that torture is undefinable so it doesn’t count. They’ll ignore the Pope when he talks about any other topic. They’ll claim Muslims worship demons and that somehow makes it okay to be prejudiced against them. Forget trying to explain that, according to the Church, other forms of life have a certain dignity too and we can’t just destroy the environment and raise livestock in squalor. No other sin so much as pings on their radar. Not even the killing of children overseas; not even the killing of unborn babies when a pregnant woman is shot in a war zone or with a stolen handgun. 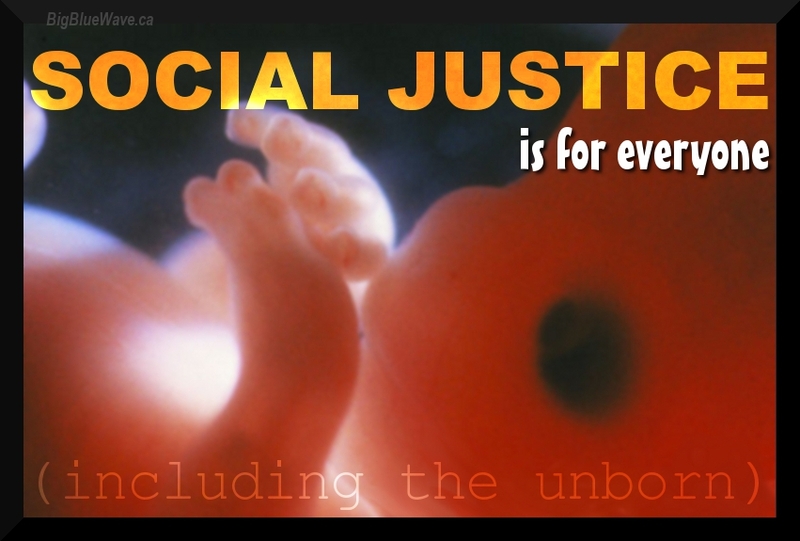 Only the unborn killed by legal abortion count. Fair enough. There are people like that in pro-life movement. Sometimes they are more Republican/Conservative than they are pro-life. Yes, we are Catholics first, and we must fight our battles by respecting our faith. And yes, you can't ignore other issues. However, here's the thing about wanting politicians who are "consistently pro-life" -- meaning they obey the Church's teaching on all life issues-- it can be very difficult to find a politician who is perfect. There is nothing wrong with prioritizing issues. And what bothers me about some left-wing pro-lifers is that they don't take into account the scale of the evil of abortion. And by saying this, I'm not saying that one human life is more important than another. They are all equally important. All lives are equal, but not all not evils are equal. It is true that the death penalty is an evil, but it's rarely applied, and the prisoner does have some means to escape it through the court system. War leads to the deaths of the innocent. No modern state is looking to kill people. Collateral damage is normally an accident. Authorities generally seek to prevent it. Abortion is about the deaths of one million human beings every year in North America. This is not monomania. Placing the emphasis on ending abortion is the morally right thing to do. Does that mean we should excuse everything a politician says or does? No. Do we have to lionize every candidate who votes pro-life? Not at all. But this also means we look at the grand scheme of things and understand what is the greatest evil befalling our society, and act with the appropriate urgency. I can understand that reasoning. The thing is, if we never prioritize fetal rights when voting, we will never advance on this issue. And that's why, overall, we have to make fetal rights the number one issue when selecting a candidate. If we don't do this, we will never obtain what we want. This is not monomania. This is a rational approach to obtaining what we demand. And we must demand it. We can't just resign ourselves to the majority not supporting our cause and then decide to vote for pro-abortion candidates just because we might get something else of what we want. That would be giving in to the evil. If you want to end an evil, you have to act like you want to end it. And sometimes that could mean voting for flawed candidates. The alternative, though, is doing nothing to end it, which would be worse. So yes, don't be a monomaniac. But don't be so fixated on every issue that you end up being useless to fetal rights.